Google search for “iteration,” April 3, 2015. 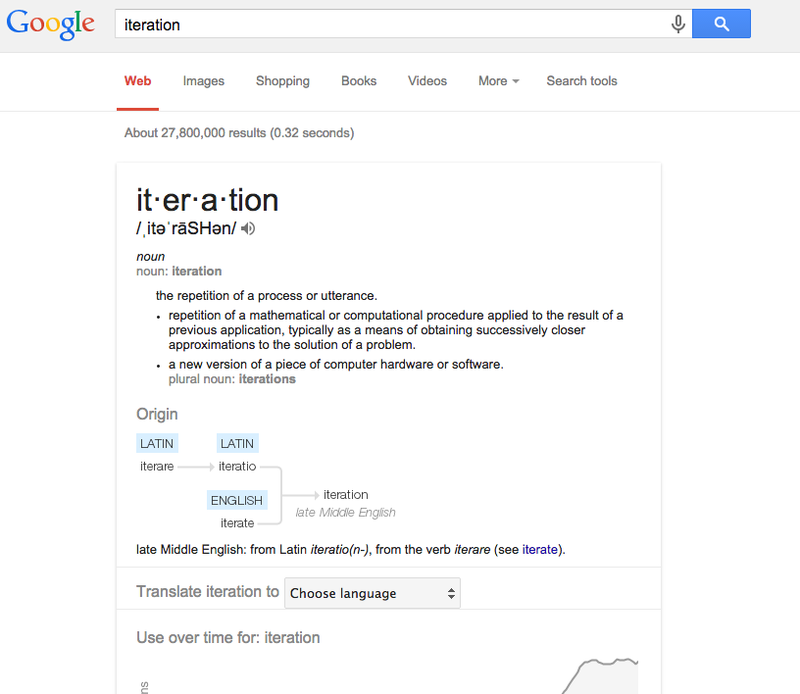 So, iteration is a word that has only recently entered everyday usage in my vocabulary. Since “iterate” already has a sense of repetition embedded, now “reiterate” (“to do a second time, again”) evokes some fugal Godel-Escher-Bach-style repetitions in my mind. I’m looking forward to getting more of a sense of what design research means, and how I might apply it to my postdoc project, as well as research and pedagogy more broadly. The definition of iteration in the screen grab at the top perhaps suggests that the repetition is not an endless repeat, but perhaps (in programming parlance) has some sort of exit condition that is checked, and maybe acted upon. Maybe re-iteration is at a different level, of stepping back from an iterative process and checking that agains some condition, to iterate on iterating? The meta-ness starts to get dizzy. +many for the Godel-Escher-Bach reference, now looking for the dusty book on the shelf…. That’s a good point, @cogdog. Iteration is repetition toward a solution. And then reiterating is approaching that iterative process anew. That’s a nice explanation! Thank you!